Granite has 1000's of colors that you can choose from which can make your kitchen countertop a center of attraction. Each granite slab color adds different element in your kitchen and is suited best with selected color cabinets only. Choosing a granite color for your kitchen countertop can be a good experience or a bad experience. But don't worry we will tell you the most popular granite colors as well as cabinets that go with them. We will tell you the trend nowadays and make the process of choosing the color an easy and a fun experience. From pure white granite to off white granite it comes in different shades mixed with grains of different colors like blue, green, brown etc. 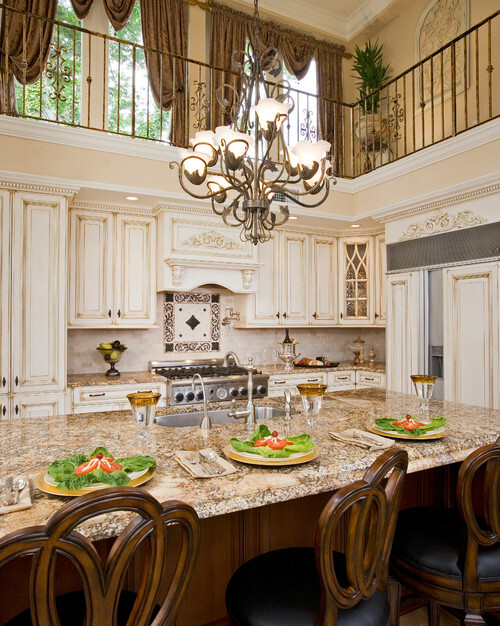 White granite helps to make your kitchen area look big, brighter and royal. Almost every cabinet color complements white granite countertop this includes white, blue, yellow, cherry and dark colored cabinets. The most popular granite colors of white granite are Kashmir White, Bianco Romano, White Galaxy, Imperial White, Fujian White, Bianco Antico, Viscount White, White Springs, Colonial Dream, Solar White, Ambrosia White, Bethel White, Andromeda White, Delicatus White, and Alaska. Black granite helps to make your kitchen look luxurious, but black granite should be used only if there is a proper inlet of light. Dust particles are visible on a black countertop so it is required to keep it clean. The best part of this is that it absorbs stains easily so less care has to be taken in a black countertop. White color cabinets are a perfect option for them, but you can also choose light wooden cabinets with them. The most popular black granite colors include Absolute Black, Black Galaxy, Black Pearl, Cambrian Black, Impala Black, India Black, and Titanium. 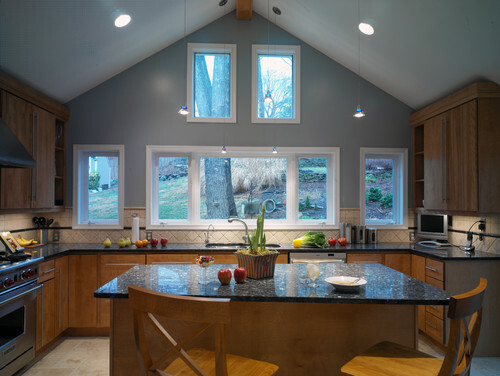 Grey Granite is used to give a varying and modest look to your kitchen. It gives your kitchen a professional look and it has fine grains of silver and black sprinkled throughout. White, grey and dark cabinets are some of the good options that you can go for. The most popular color in gray includes Grey Pearl, Impala Black, Cosmos, Luna Pearl, Silver Cloud, Silver Galaxy, White Leopard, and White Wave. 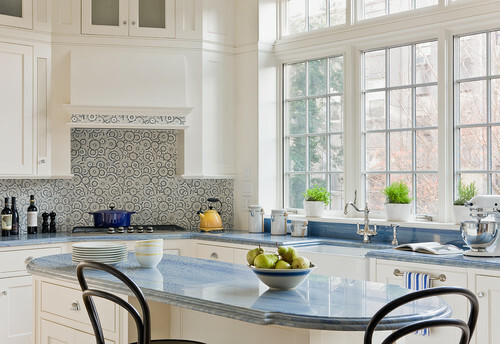 Adding blue granite to your kitchen countertop means giving your kitchen a natural touch and a soothing comfort. These are difficult to find as not every shop may keep them and because of its low availability, its price is also high. You can choose light wooden and white cabinets with them. Top colors in blue granite are Blue Pearl, Sapphire Blue, Volga Blue, Blue Eyes, Blue Bahia, Bros Blue, Blue Fantasy, Bahama Blue, Dynamic Blue, and Louis Blue. 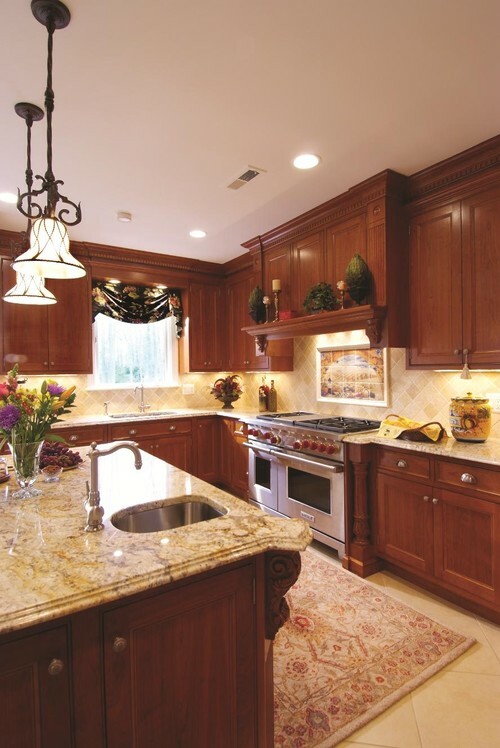 Brown granite gives a warm feeling to your kitchen and looks like a complete set with the right color shade. Most importantly it goes with the wooden interior in your kitchen. If your countertop is a light shade countertop then choose a dark colored cabinets, but if your countertop is dark brown then choose a light colored cabinet. Well-known colors in brown granite include Baltic Brown, Tan Brown, Giallo Veneziano, Tropical Brown, Autumn Brown, Ivory Brown, Carmel Brown, Labrador Antique, and Coffee Brown. 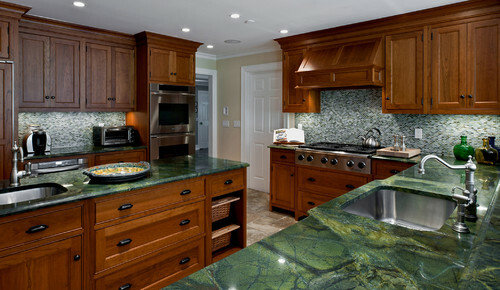 Green granite adds a tropical look to your kitchen. It has different minerals suspended in it and its presence gives you peace of mind. 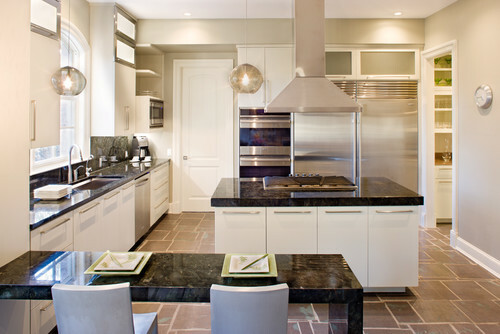 Going for white cabinet is a good option for green colored cabinets. Green granites are exceptionally fashionable these days. Some of the most wildly popular colors in this gallery include Ubatuba, Verde Butterfly, Peacock Green (aka Verde Peacock), Tropical Green, Verde Labrador, Verde Lapponia, Emerald Green, Silver Sea Green, Verde Marinace, Verde San Francisco, and Verde Fire. Blue pearl granite is a metallic shade with a slight silver shade. It has a shine that resembles that of pearl. Like other granites each piece of granite is different from the other. The slab may have light blue shade at one place and dark blue shade at the other place. Choose either a white colored cabinet or a dark colored cabinet combined with white color for blue pearl granite. Beige granite has a creamy blend of different colors like brown, black and gray. Beige granite looks similar to white granite, but the combination of different colors attracts many home owners to use it in their kitchen. The most popular granites in Beige color are Colonial Cream, Crema Bordeaux, Giallo Ornamentale, Giallo Santo, and Santa Cecilia Light. 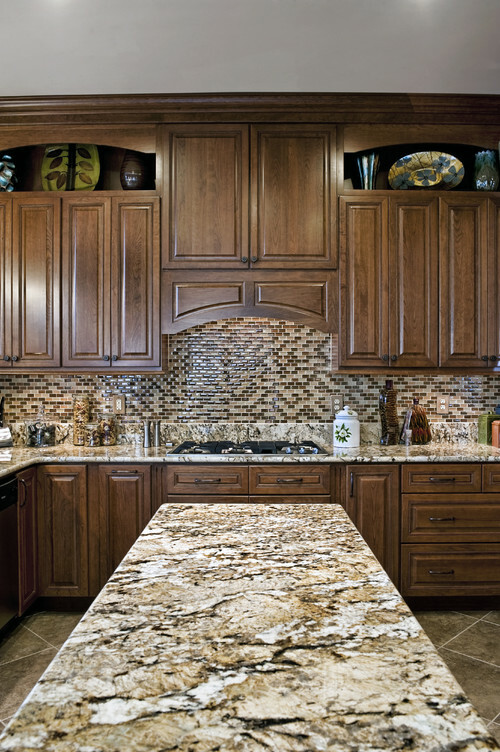 Beige colored granite can go well with both dark and light colored cabinets. You will have more decorating options with beige colored granite and it gives your kitchen a traditional and country look. This colored granite generally has a golden background which have silvery mica, white rock or translucent quartz embedded in them. Gold granite has black, blue and burgundy color veins in them, it has both light and dark hues. If your countertop is a light shade countertop then choose a dark colored cabinets, but if your countertop is dark brown then choose a light colored cabinet. Gold granite has New Venetian Gold, Madura Gold, Kashmir Gold, Sunset Gold, Golden Beach, Golden Crystal, Key West Gold, Delicatus, and Santa Cecilia among most popular granite. Red Granite is a very unique color and very few people dare to go for it. 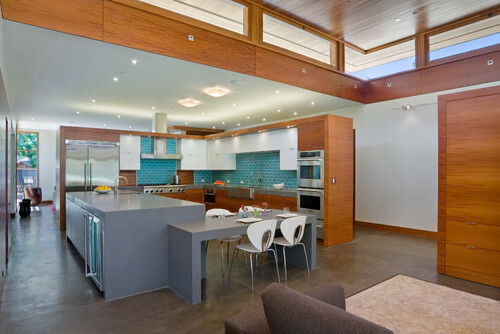 But if they are not matched correctly with the right countertop then it can mess the look of your whole kitchen. It has veins and patterns of black, blue, white and gray color embedded in them. 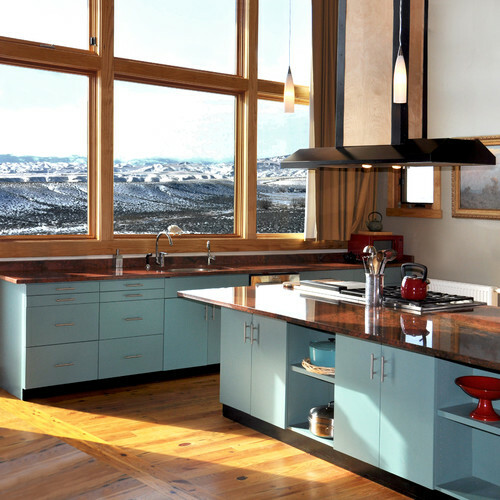 Red granite adds power and energy element in your kitchen. 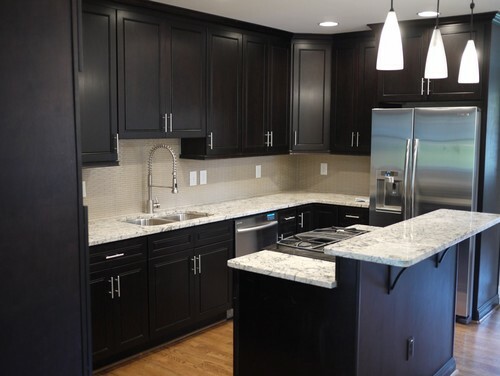 Dark wooden cabinets and white colored cabinets compliment them the best. The most popular colors include Iron Red, Red Dragon, Balmoral Red, Eagle Red, Imperial Red, Karelia Red, Maple Red, Missouri Red, Multicolor Red, Capao Bonito, Royal Red, Ruby Red, Sunset Red, Bordeaux, and Juparana Bordeaux.